Carrying linguistic associations with aristocratic French residences, 'hotels' were considered rather pretentious by the British in the early 19th century. At this time, hotels were only open for live-in guests, who ate their food in small private sitting rooms. By the middle of the century, communal dining rooms had become more common, but again only lodgers could eat in them. 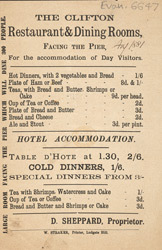 Gradually, however, hotels opened to the public and by the end of the century had become one of the few places in which it was thought acceptable for men and women to dine together.